No disrespect to the Sarajevo Film Festival, but if Michael is going to make a grand appearance there, with director Cary Fukunaga, to promote 'Jane Eyre', then it's pretty safe to go on ahead and make plans for TIFF for a double serving of Fassy in Toronto. And looky! Michael done cut off that blond stuff and starting all over again! Clean crew top and those fingers! Very close to fans - things may be calmer in Sarajevo eh? 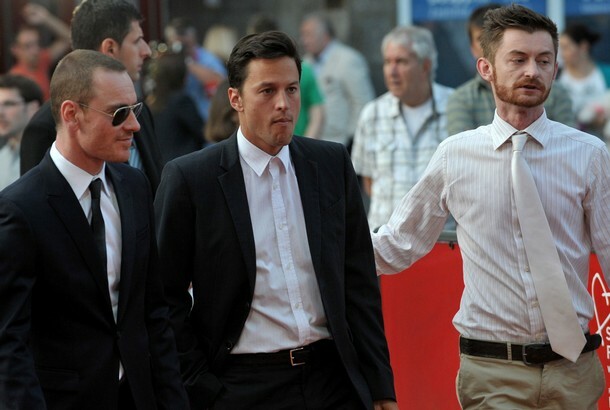 Cary is damn handsome man... and Fassy is too! 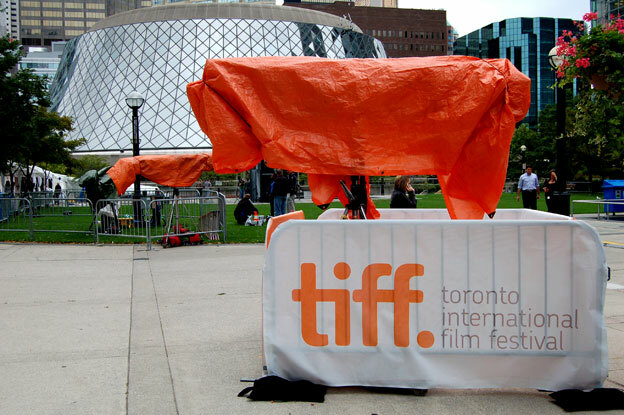 A media film camera covered up at Roy Thomson Hall in preparation for that evening's Gala in 2010. I wanted to take a moment to write a bit more about the upcoming Toronto Film Festival based on the film screening announcements yesterday. Already the 36th annual TIFF is off to a brilliant start with so many fantastic films to debut and screen at TIFF. 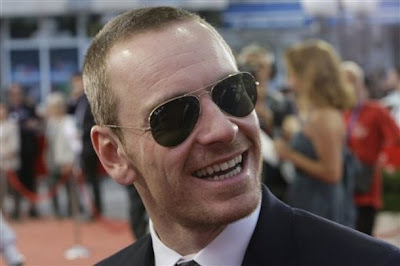 However for now, I will be focusing just on the two Michael Fassbender films that have been announced. 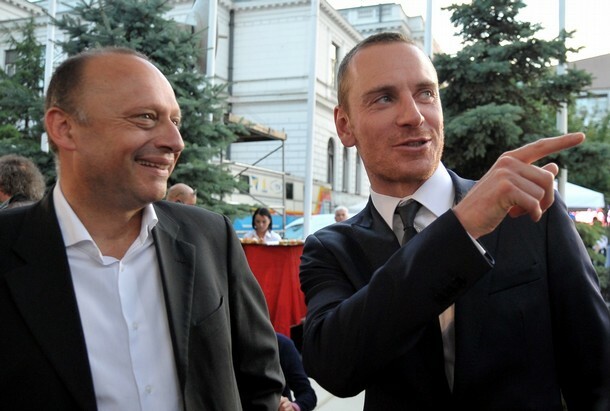 As I have long speculated, both 'A Dangerous Method' and 'Shame' will be there in September. For the fancy schmancy Gala presentation, we will have 'A Dangerous Method' as this type of film only deserves the crème de la crème of red carpet dazzle and publicity. It is directed by hometown boy David Cronenberg, and starring his muse Viggo Mortensen, Keira Knightely, Vincent Cassel, and our Michael Fassbender. Then on the highbow slighly lower scale screening event, we'll have 'Shame' as a Special Presentation. The SP screenings run the gamut throughout the city as to which screens it will appear on. Only Galas are at Roy Thomson Hall, and with the opening of the Bell Lightbox last year, surely many SPs will be shown there, and 99% of us reading this right now, have yet to experience watching a film at the Bell Lightbox. I did have the honor of having a pre-public preview of the Bell Lightbox last September with my friend Glenn (who is a major donor to TIFF), and we were one of the first to look inside the theaters there. They are not only handsome and posh, but they were built to accommodate screenings for TIFF during September, and for art house cinema throughout the rest of the year. I for one will very much welcome watching Shame at the Bell Lightbox, especially in the large theater, where literally there will not be a bad seat, even if you sit upfront, you won't suffer neck pains, but then again, who wants to sit so close to the screen... unless, for Q&A time during TIFF. The downside is that the Bell Lightbox does not appear to be redcarpet fan friendly (like the revamped RTH, more on that in a bit). Ticketholders will have to go directly into the theater of their screening - and I already envision in my mind, which area of the theater will be 'reserved' for VIPs, and those are great seats. In any event, what I want to mention is that there are many secretive nooks and crannies at the Bell Lightbox that caters to VIPs and special guests, and the public will not have access to it. I would think that the blocked off areas will house VIPs who want to wait out the screening, hang out there, drink champagne/wine, and when the film is over, go into the theater to answer questions. That's all fine, but, the secret to a successful screening at BL will be to be in line early so that you can get into the theater first, and then quickly assess your brand spanking new surroundings, and then grab a seat. It will be disorienting as heck, but I will figure it out somehow. I'm just mentioning all this as I believe that the films that were shown at Scotiabank Theater on Richmond St. will migrate over to the BL - and it's just going to be a whole new game over there. I think a lot of films will still be show at Ryerson, only because it's so large and accommodating, but too much money was put into the BL to let it go to waste during TIFF time. 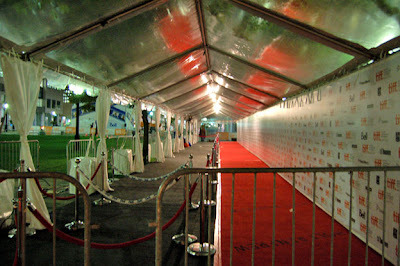 An empty red carpet at RTH, the calm before the celebrity/media storm. Now, in regards to the Roy Thomson Hall. Last year when I was there to see Black Swan, it was my first time there since 2008 as I did not see a screening there in 2009. So it was to my shock and horror to find that TIFF had up and changed things 360 degrees and it kinda irked me a bit. 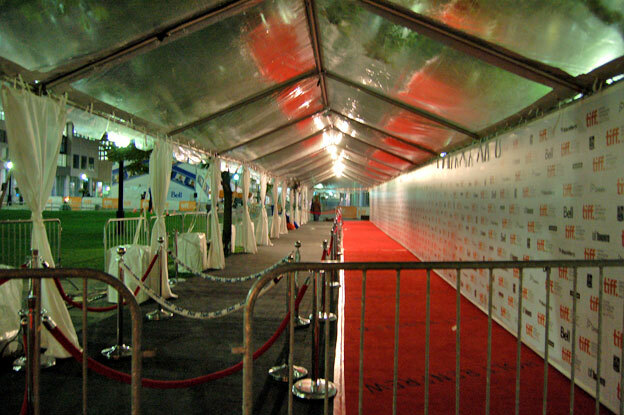 Firstly, if any of you reading this are familiar with the previous years red carpet at RTH, you know how spoiled we were in lining up, seeing the stars, getting autographs and pictures - then run into the hall - no problem. But now, because the Galas are so high profile now... they are catering to the Oscars and in doing so, it has an Oscar's red carpet atmosphere around it. The red carpet for Galas at RTH are now on the polar opposite side of the damn building, completely preventing anyone who has a ticket, to watch the red carpet while they are lined up to enter the building. The red carpet set up now, pretty much allows just paparazzi, stans*, and serial red carpet watcher fans, who literally stand there all day just gawk at the celebrities entering into RTH when the Gala begins. 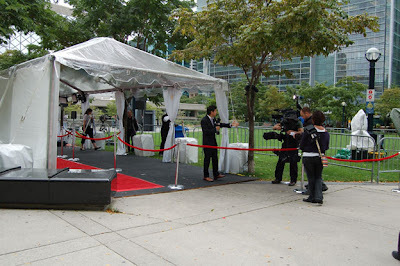 And last year, TIFF introduced some local Mary Hart wannabes who interviewed the celebrities as they walked the red carpet. They get an A for effort, but for such a new arrangement, I reckon they need presenters who are very skilled at interviewing and 'presenting the red carpet'. New as of last year, RTH red carpet presenters and interviewers. TIFF changed last year. When me and my friends arrived to our seats at RTH, we saw on the very screen where the film would be shown, there was a live feed from outside on the red carpet, broadcast inside for us to see. So that was a cool surprise, but it still made me yearn to be right out there to see it live for myself and get a few pictures. And because it was Black Swan, besides having some interest to see Natalie Portman, Darren Aronfosky, and Vincent Cassel in the flesh, I didn't have such a fever to be out there, BUT, this year will be different. If you plan on getting tickets to the 'Method' Gala and *think* you can do the red carpet and run around the building and get inside and find a good seat, think again. You can't have your cake and eat it too at a TIFF gala, you gotta chose one or the other. And RTH is clamping down on late arrivals too because if your ticket isn't scanned by a certain time, they will free up that ticket seat for the poor soul lingering in the Rush Line. So those are the sucky things about the red carpet free for all RTH. Since TIFF has now pretty much become THE film festival to screen a future Oscar winner... TIFF is going to act like the Oscars at the Galas. 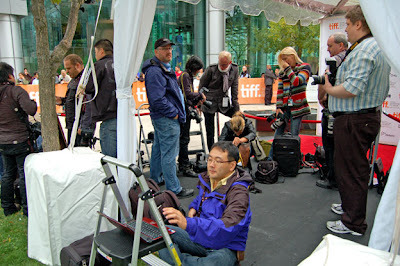 The Paparazzi and the media work hard during TIFF, and they always have the best seat in the house. I sometimes envy them. So close, but yet so very far away. ps. RTH has probably hired Gala staff who have black belts in karate, so, trust me, don't test them. When they tell you to move - move, when they say go, go. That was a very thorough assessment of the logistical ballet you will encounter at TIFF this year, Simone. We Fassinators know you will be as relentless, yet professional as possible, in getting all the scoops about Our Man in Toronto this September. Good luck! Thank you. I felt compelled to share with the readers what my experience has been like at TIFF galas, and how different it has changed, esp re: The Fassy Factor. Love the new look! Finally, the ginger is coming back. I guess by the time of TIFF, you will be able to see his grow-out hair. Thank you Simone for the thorough explanation of TIFF. Although I couldnt go this year (DAMN), hopefully, i can go there in the near future. Good luck and enjoy your time there. 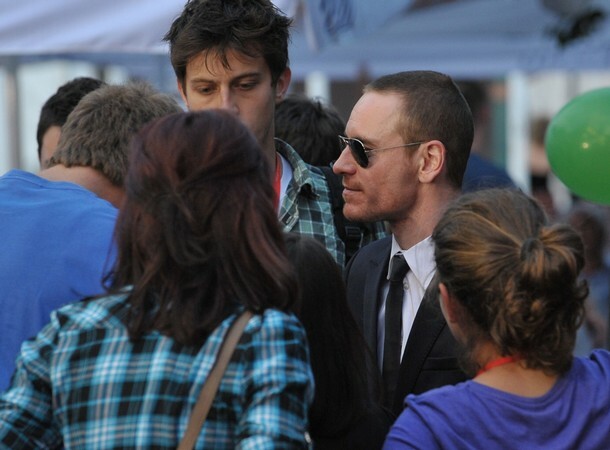 I'm looking forward to reading your Fassy factor! FYI above is an interview from one of the best "fan sites" on the web for an actor.